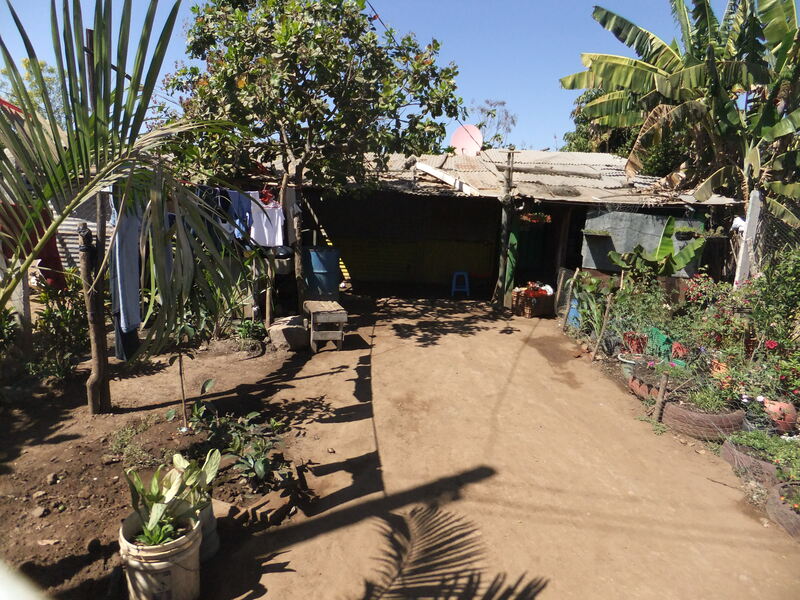 The Victoria Central America Support Committee (CASC) has been supporting the little village of El Milagro for a couple of years. 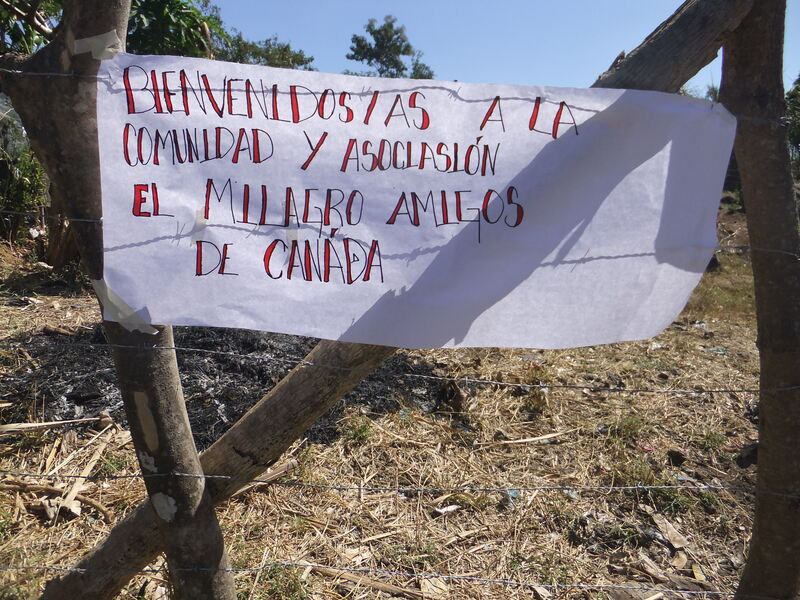 This community was created when a group of families, living on a garbage dump, was moved by the FMLN government to their own land, although it was completely undeveloped land. 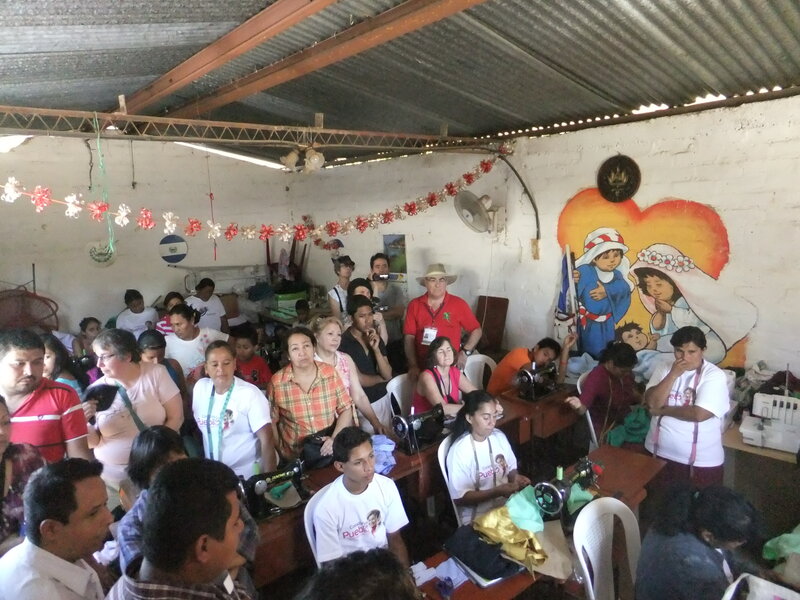 The Victoria FMLN club and CASC took on the project of assisting El Milagro to build a new health room and expand their small community hall. We raised $1600 US, but some of that amount was borrowed, so donations via CASC or myself would be much appreciated. 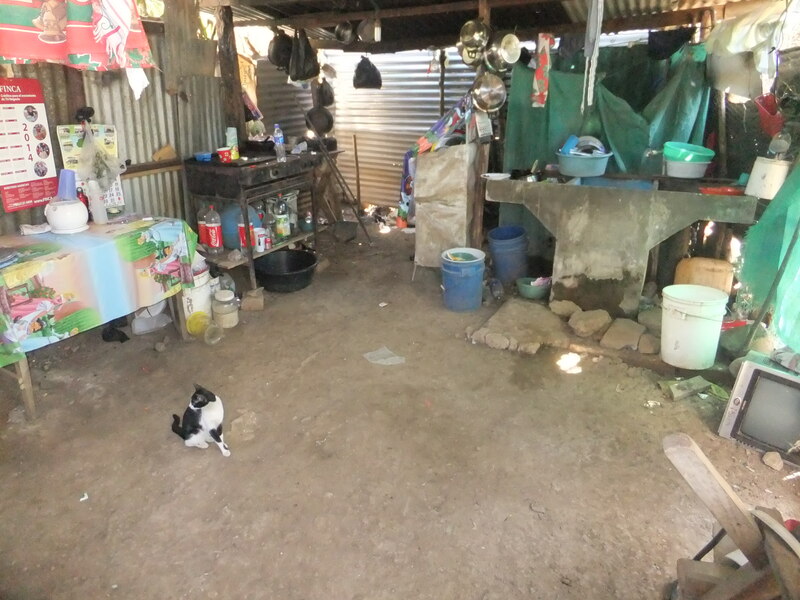 During our last visit in 2012 we saw their rough new homes and streets, the chickens which the government had distributed to many of the families, as well as the new sewing machines in their hall, and lots of barefoot kids. Below are some photos and notes describing our recent visit to this village. One family put up their own welcome sign for us. Here is the present community hall. The plan is to use the $1600 to open this wall up and build an addition with a “health room”, as well as patch the roof and upgrade the electrical system. As you can see the room is full to capacity with sewing machines and willing students (and us visitors). 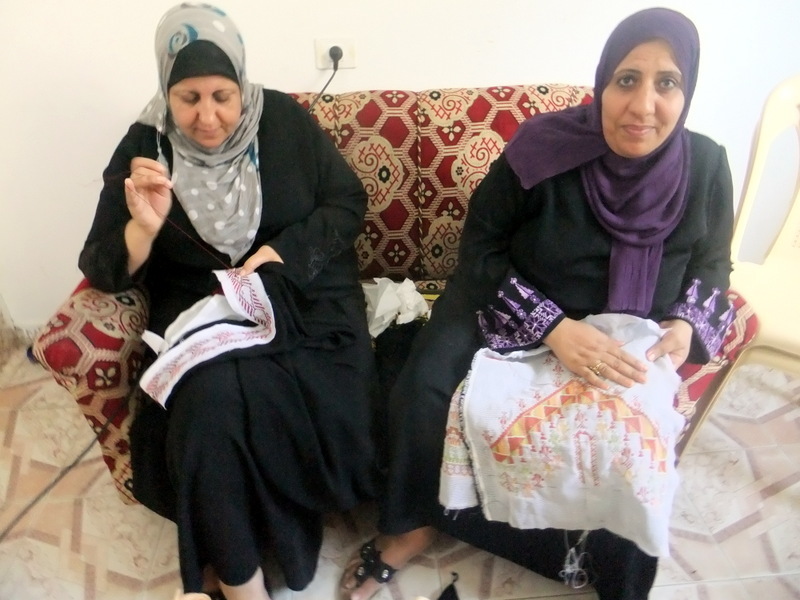 Sewing classes were in progress, with the aim being to able to supply the government with uniforms for school children. 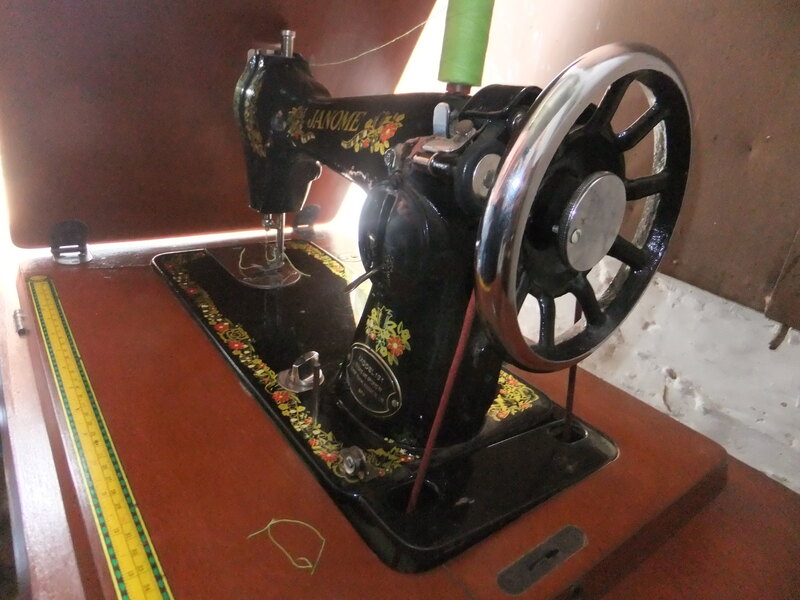 Their “new” electric sewing machines are of an old solid design, that can be run with a foot treadle when the power is off or limited, which it often is. 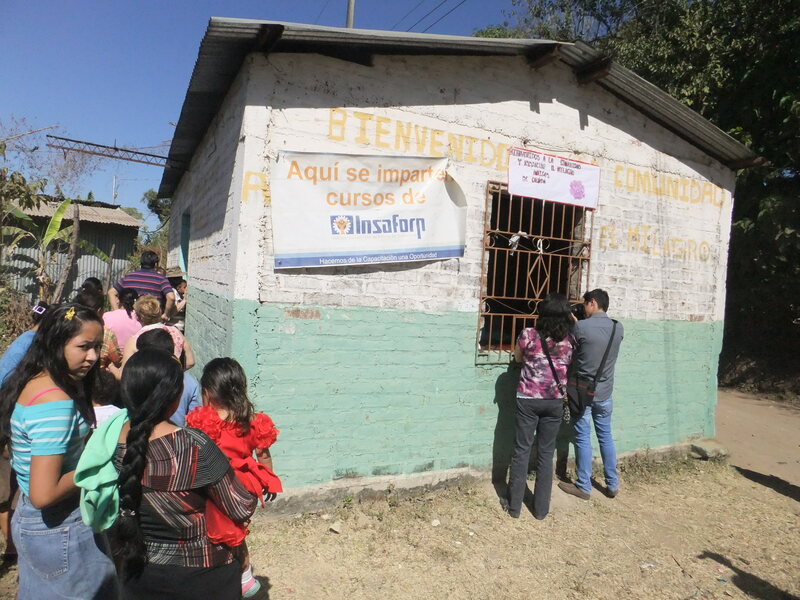 When we arrived, one of the community’s regular government health clinics were underway. Due to the lack of space, it operated under tents and the tailgate of a truck. The new “health room” is direly needed, and donations for it can be made to CASC. These Salvadoran doctors were trained in Cuba. 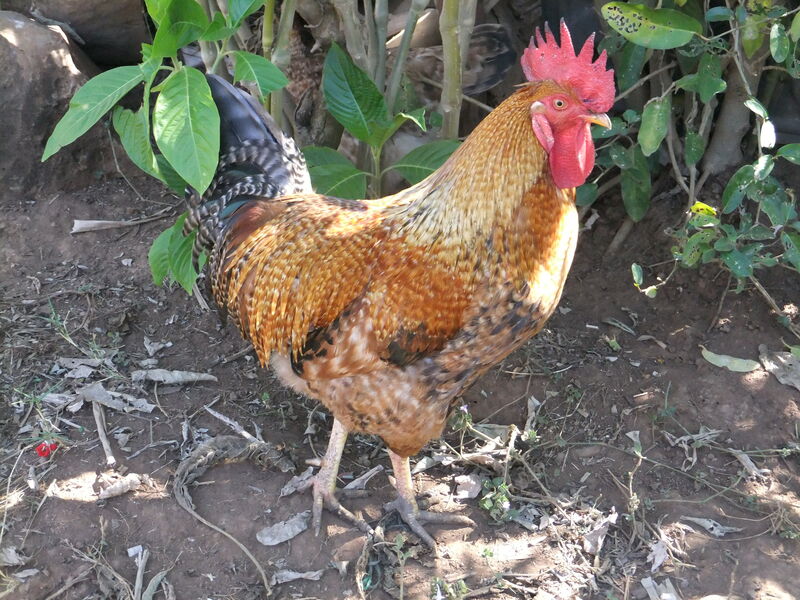 One of the chickens, from the previous 2012 project, to supply the community with a stable source of eggs and meat. Unfortunately due to the lack of feed and animal husbandry training, this project has not fulfilled it’s promise yet, but this proud fellow is doing his bit. The yards and housing have improved from our last visit, but it’s still pretty rustic to say the least, but they own it all. Here’s a few of the locals, all with shoes on their feet this time around. And here is the future of El Milagro. Students in a near by elementary school with free education, uniforms and shoes and a glass of milk a day, courtesy of the FMLN government. 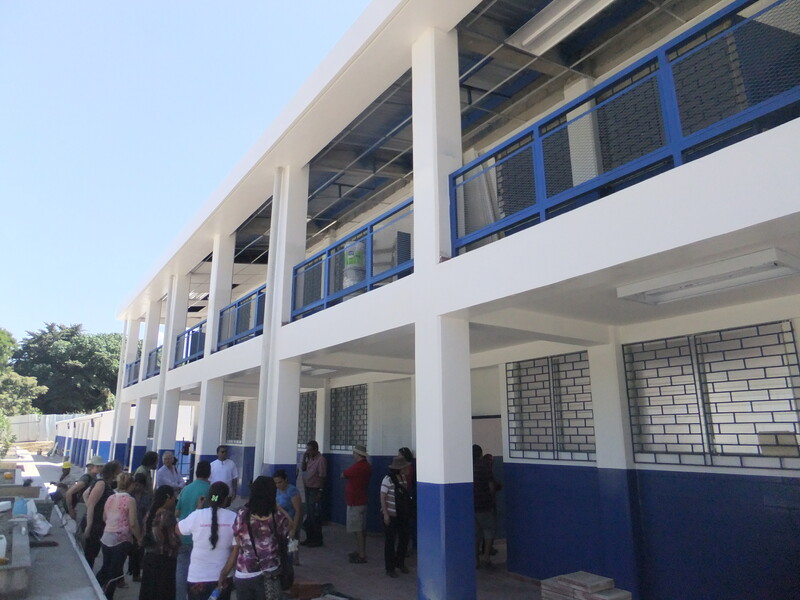 El Milagro’s kids were limited to elementary school, until this new high school was built by the government on land donated by the Catholic church. 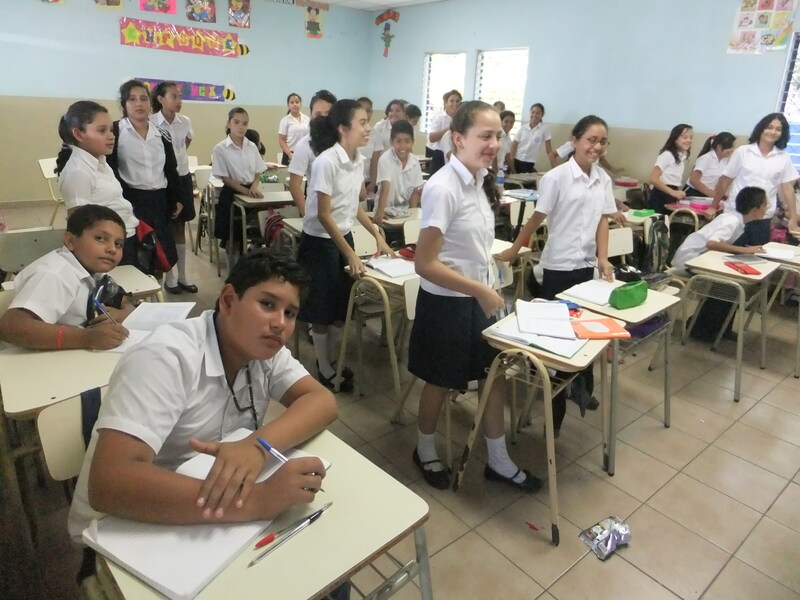 The three El Milagro students ready to attend this school could not afford the $2 taxi fare, until the Montreal FMLN stepped up to pay this cost for a year. 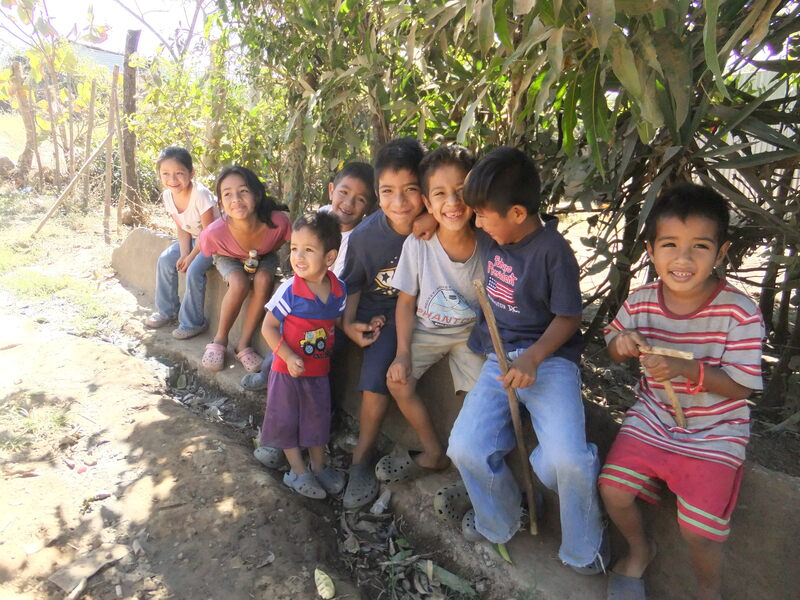 And here are a couple of the people to thank for the progress in El Milagro and El Salvador. 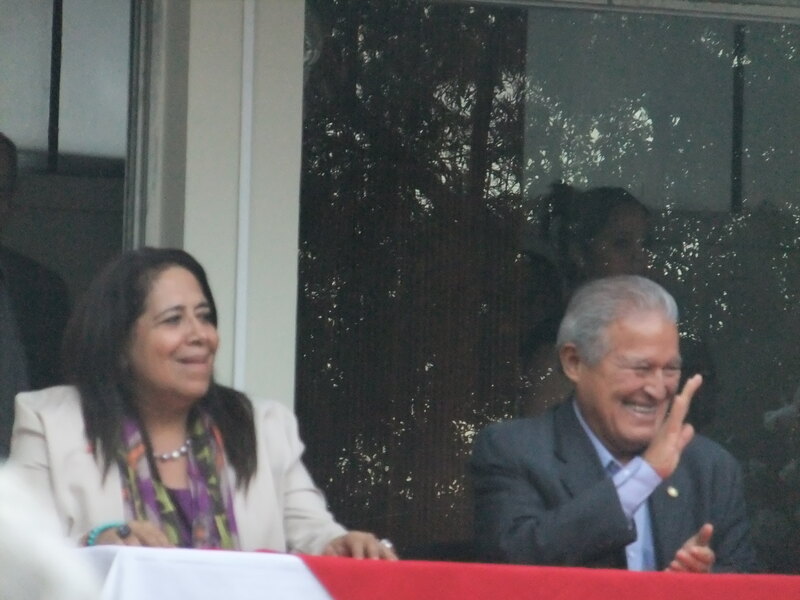 Former FMLN commandante and present parliamentarian, Nidia Dias and former FMLN commandante, and present Vice President and future President, Salvadore Seren Sanchez. Watch for the results of the March 9th runoff election, which, if my health holds out, I will be an observer at. Well I arrived safe and sound in San Salvador a day ago. I will be an official election observer for the FMLN political party during the presidential election on February 2nd. All the International observers went through a day of training today. Although I have done this in three previous elections (2000, 2009 and 2012), the right wing always comes up with new tricks that we are told to watch out for. 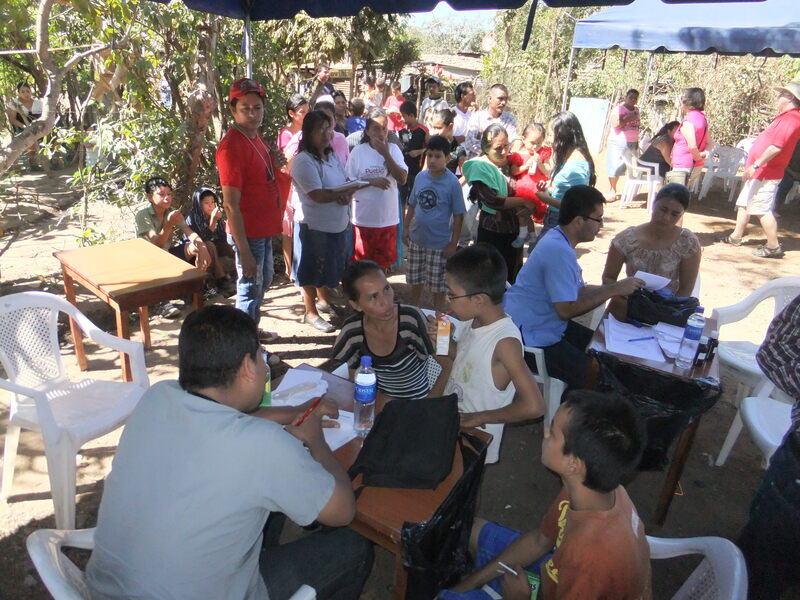 Of note is that with the FMLN in power for the last 5 years they have greatly improved the plight of the poor people. Two things in particular are free education and school uniforms for all students, as well as a guaranteed glass of milk each day for them. 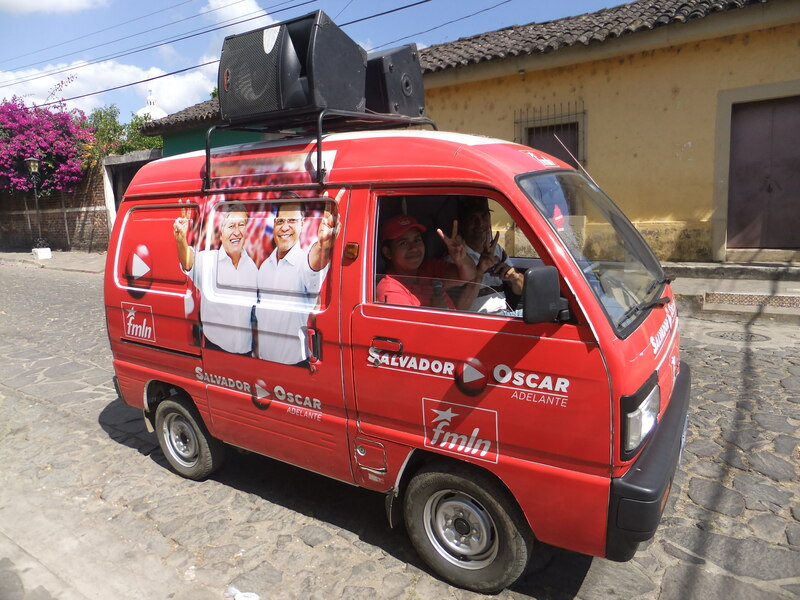 Strangely the right wing opposition ARENA party is using advertisements of smiling uniformed kids with glasses of milk in their hands, trying to usurp the FMLN success. I’m sure there will be more tricks to come. My recent slide show/talk went very well, with a packed hall of supportive and interested folks. Over $400 was raised in donations, which will go towards publishing pro-Palestinian advertisements in Canada. I expect to put on other similar events on Galiano Island and Nanaimo in the future. If anyone is interested in having me visit their community to show my photos and discuss Palestine/Gaza, please feel free to give me a call at 1 250 595-3991 or neish@victoria.tc.ca. Thanks to all who helped with this very successful event. Kevin Neish recently spent 4 months in Gaza, working with the International Solidarity Movement, witnessing and collecting information on the life and conditions of Palestinians under the Israeli siege. He will give a first hand account on what he worked on, saw and experienced. 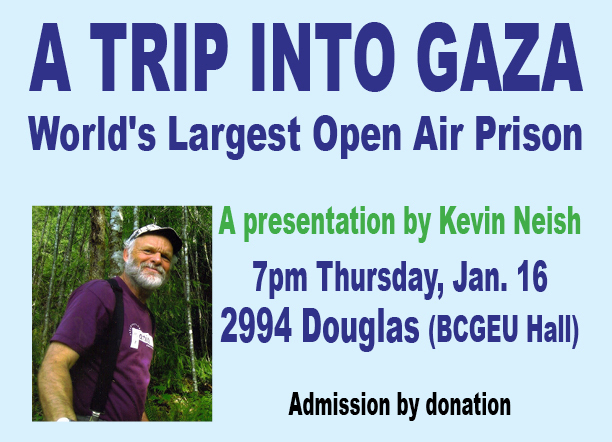 Kevin Neish is a former college instructor as well as civilian technician for the Department of National Defence, and has been active in the quest for justice for Palestinians since the 1980s. He has sailed on board two ships attempting to break the blockade of Gaza – the Mavi Marmara in 2010 (during which 9 activists were killed by Israeli commandos) for which he was interned in an Israeli prison and then deported, and the Tahrir in 2011, leading to his arrest by Greek commandos by Israel’s behest. Mr. Neish has provided protective accompaniment to Palestinians in Gaza in 2013 and Bethlehem in 2002. 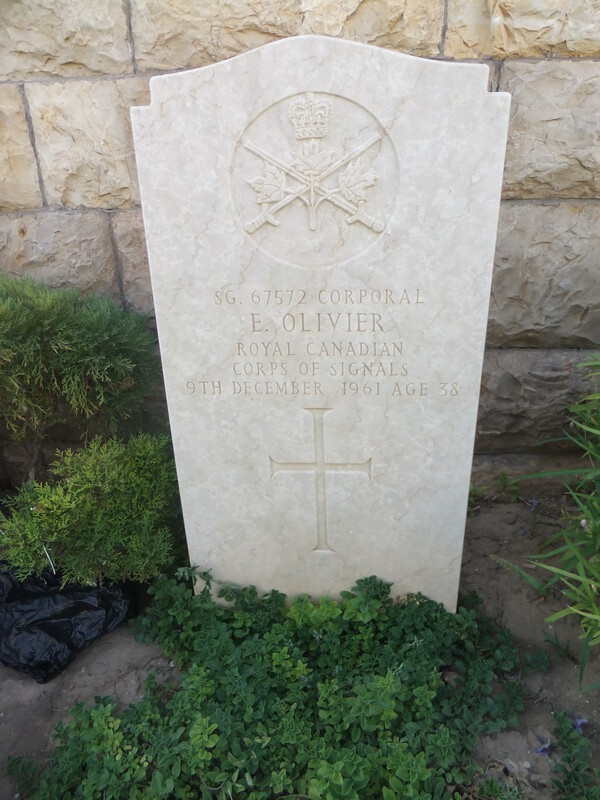 I temporarily removed this last post about my leaving Gaza, in order to ease access to my previous post about the Gaza War Cemetery, for some possible visitors who were related to the people buried there. Since I left Gaza on Sept 19th, their situation has gotten much worse due to the dual blockade of Israel and Egypt (with US and Canadian support). Medicines and food are running out, dialysis machines are shutting down and electricity is now only on at the most 3 hours a day. Imagine your city with shut down hospitals, ambulances, fire trucks, schools, sewer and water plants, refrigeration etc etc, because of an occupier’s collective punishment. What would you do to save your family, friends and community from such suffering and illegal oppression? I will hopefully be leaving for El Salvador in January to be an official observer in their presidential election on Feb 2nd. I wasn’t planning to do this, as 4 months in Gaza knocked the wind out of me a bit, but it’s a crucial election for the FMLN. I have observed three previous elections, so I know the routine and what cheating to watch out for, so I’ll hopefully be of some use. If any of you are interested in being an election observer, visit the website of CIS in El Salvador, as they operate an excellent observer program for foreigners. They want long term and short term volunteers. Your solidarity will be greatly appreciated. Just a very quick rough note to let anyone listening know, that I returned home to Victoria last Friday afternoon (Sept 19th). When I’m in a better frame of mind I’ll see about writing a bit more about my final experiences. I had already been turned away at the Rafah crossing on Sept 8th, along with a bus full of Palestinians, some of whom had already been turned away 4 times or more. It was a bus full of sick folks trying to get critical treatment in Egypt or abroad, students trying to get to scholarships in distant countries, business people trying to get back to their now failing companies abroad and others in similar crucial situations, all just trying to temporarily leave Gaza. When we were turned away, after waiting for 5 hours, there was not a word of protest or complaint, just a dignified and orderly return to the bus and Gaza. The Palestinians constantly asked why I was crossing into Egypt with them, instead of going through the Israeli crossing at Erez and just fly from Tel Aviv, like all the other foreigners. I just had to say “Mavi Marmara” and they all understood my situation. When I did get through to Egypt, it entailed the usual humiliating treatment by Egyptian authorities. Being herded like cattle, pushed, shoved and yelled at. Hours of waiting in an over crowded filthy customs hall. Passports are returned, by being flung across the room at you. 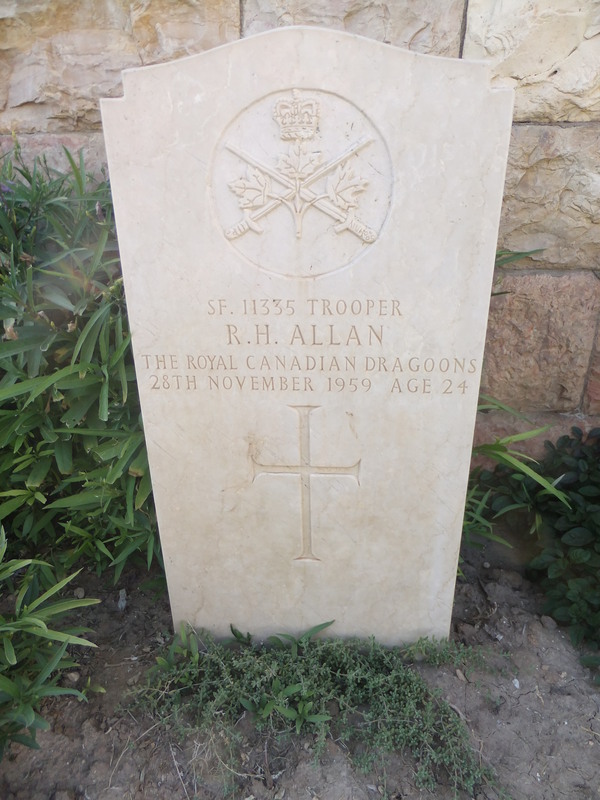 At one point, a soldier intently looked at my passport and then at me, and then handed it back, to the wrong person. But everyone just patiently and quietly waited for the Egyptian “yay or nay”. When our bus was finally permitted to enter Egypt, there was a bizarre scramble of kids and babies around the bus. It turned out that the Egyptians only allow seated passengers to enter, so the whole bus collectively cooperated in tucking little kids next to small adults and extra babies onto stranger’s laps, so everyone had a seat. When only one or two buses a day get through, every bit of room for an extra passenger was crucial. 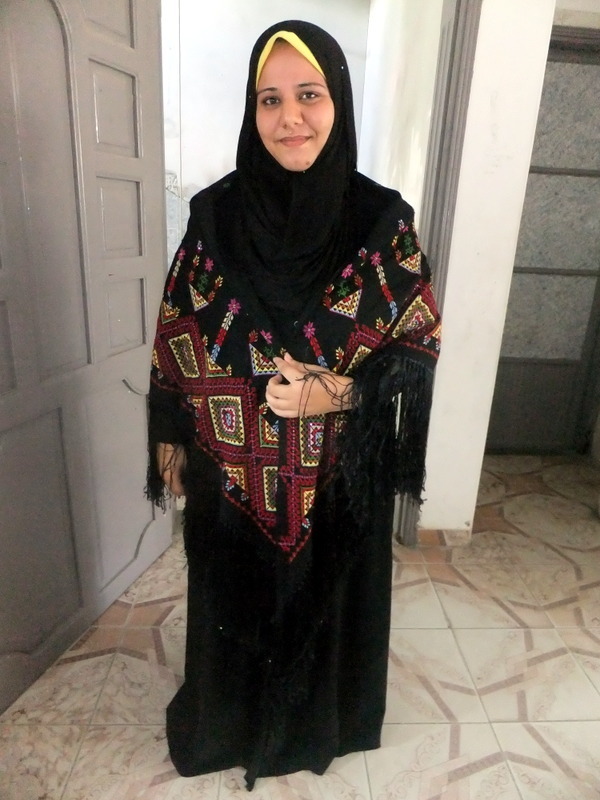 A well educated young Palestinian women, Malaka Mohammed, who heading to a prestigious scholarship in Europe, for her own safety, asked to travel in our private “foreigner” taxi from Rafah to Cairo. She was safer, but even so, she was constantly insulted by soldiers, police and plain clothes thugs, at the 7 or so check point stops we had to get through. For 7 hours she quietly endured outrageous sexual come ons, insults, ethnic put downs and having her suitcase repeatedly emptied out onto the ground by uniformed goons, who used all the authority an M-16 could give them. To be a Palestinian in Egypt, is now seemingly against the law. 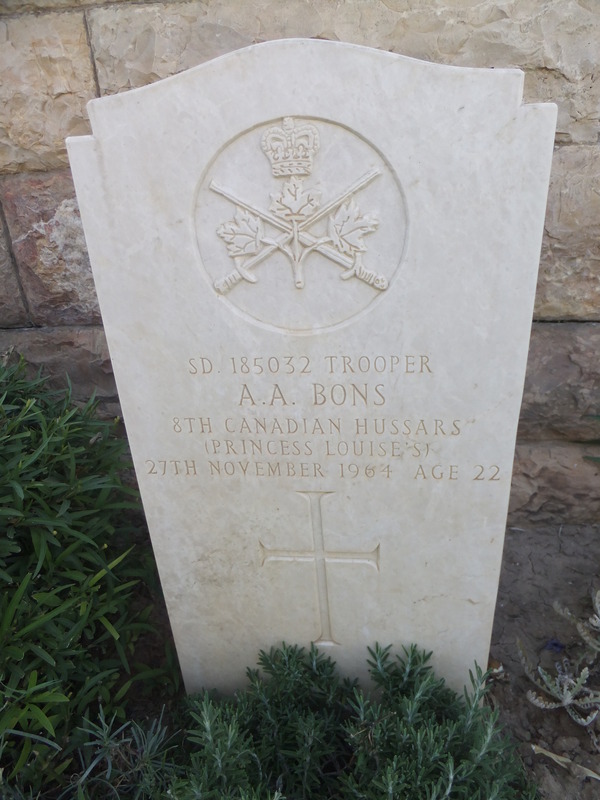 After I got home, I read that Malaka received a hero’s welcome in England, with a plaque mounted in her honour. After spending over 4 months in Gaza, I think one of the most important things I did, happened in my last minutes there, by simply offering her a ride. Being white and male, I received better treatment then Malaka, but being Canadian may now offer little added protection, as John Greyson and Tarek Loubani will testify to from their Cairo prison cell. I have no doubt that Mr. Harper, and his pro-Israel Canadian government, are happy to see them stay in prison due to their pro-Palestinian beliefs. Stateless Canadians, due to their political beliefs. 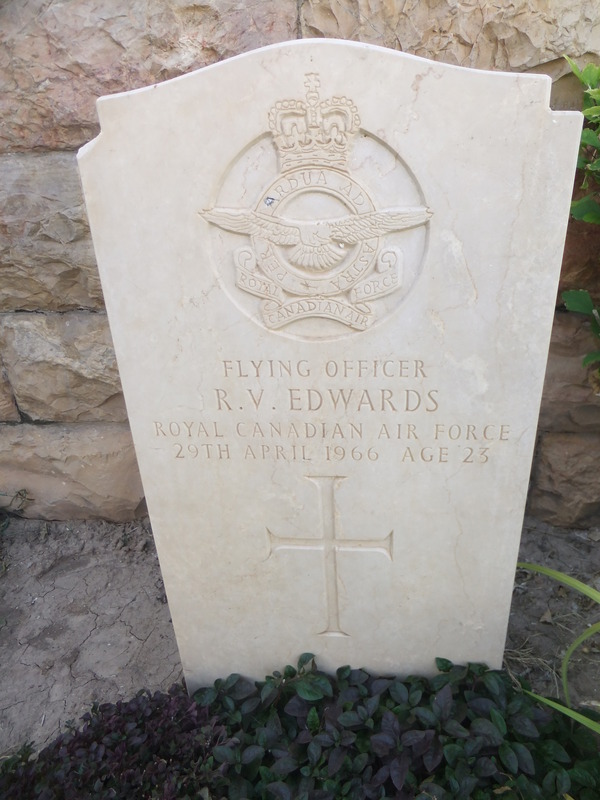 Needless to say, I have no photographs for you of the burned out check points, scorched military buildings, rows of Egyptian howitzers, tanks, Apache helicopter gunships and APCs and dozens of fortified gun emplacements across the Sinai. Arriving at the Cairo airport after curfew was not the end of the ordeal. I had to sneak into the lobby, past a guard at the entrance, by going through the airport’s exit doors. Then, just to get into the check-in area, I had to forge a bogus plane ticket to get past yet another security check point. Once in there, a sympathetic airline clerk, upon hearing of my Gaza trip, reactivated my overdue, cancelled plane ticket at no charge. Then I just had to run hard to catch the 4 am flight home, all the while thinking of John and Tarek sitting in an Egyptian prison cell. When I left Gaza, the situation was getting even more desperate, then the “standard” horrendous situation I had been witnessing for the last 4 months. Little or no gas, diesel, propane, food, electricity, medicines, work or hope. This new cooperative double blockade, from Israel and Egypt, means that the only available border Gaza has, the Mediterranean Sea, is even more important then ever. We need to support any ship, coming or going to Gaza, and break this illegal and immoral blockade, before more people needlessly suffer and die. If Gazans are offered no hope or assistance, and Israel continues to blatantly break the Nov. 2012 ceasefire agreement, then the Palestinians may strike out in desperation and anger with their rockets. 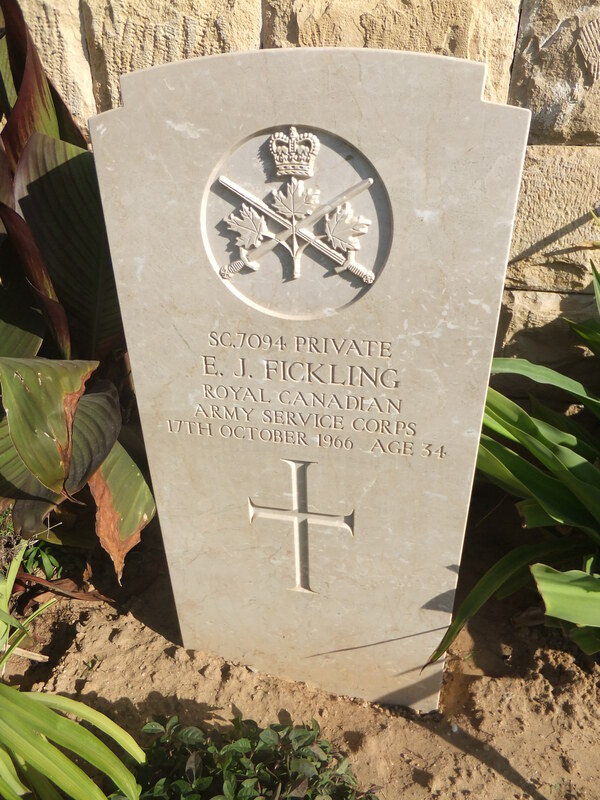 I spent an insightful and peaceful afternoon at the Gaza War Cemetery. As friends will know, I’ve been an anti war activist all my life, and my spending time and effort to publicize such a place, may seem out of character for me. 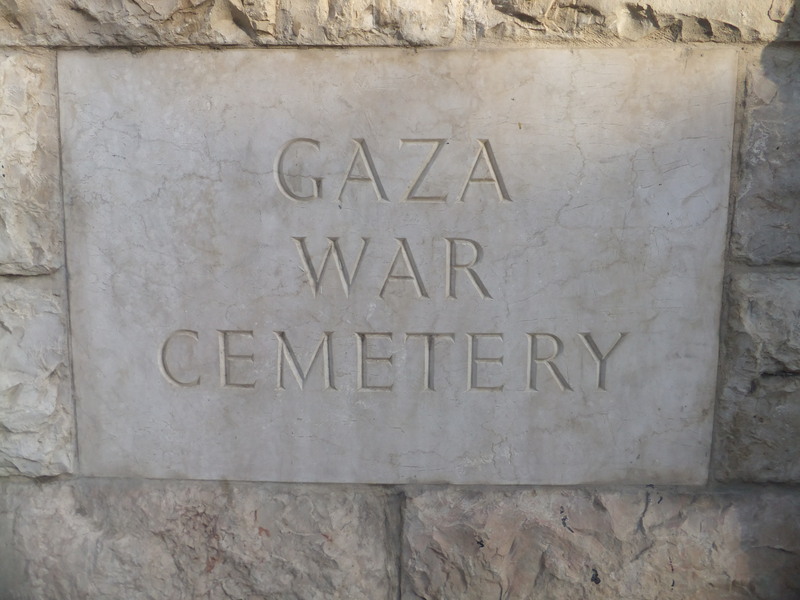 But there is a lot to learn from such places, especially at this war like time and especially in Gaza Palestine. 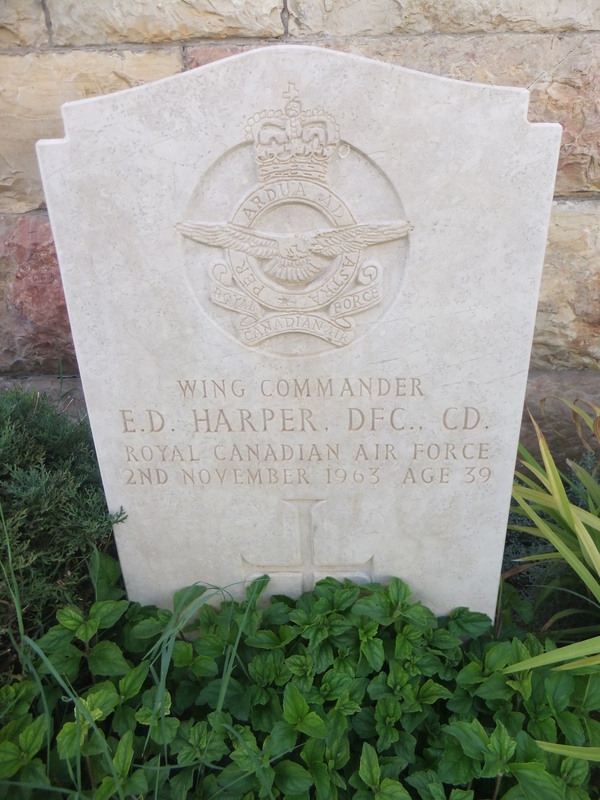 And I discovered some strong connections to Canada there…22 of them. 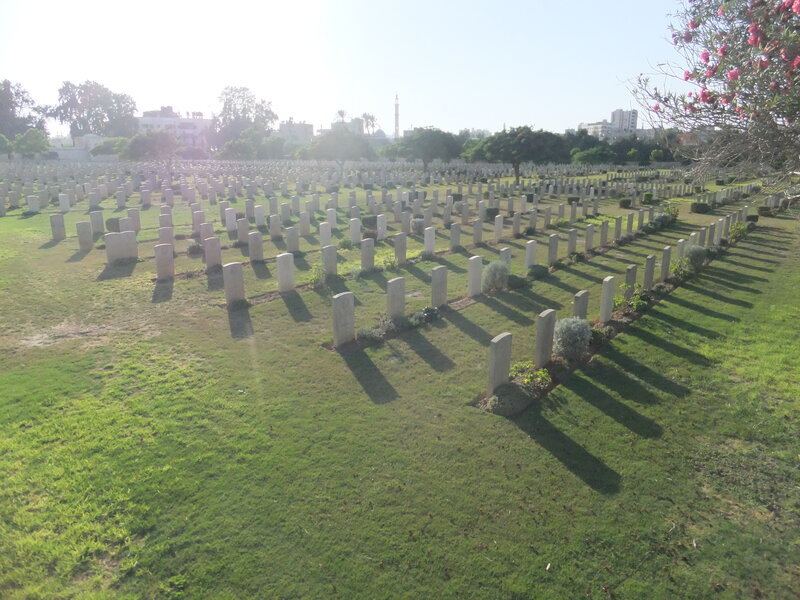 As you can see, it is a beautifully and honourably tended graveyard, especially considering the deprivations that the Gazans have gone through, with a lack of water, power, supplies and materials, all with a back drop of a continuous occupation and war. In a parched, sandy, overcrowded Gaza City, this place is a quiet oasis. 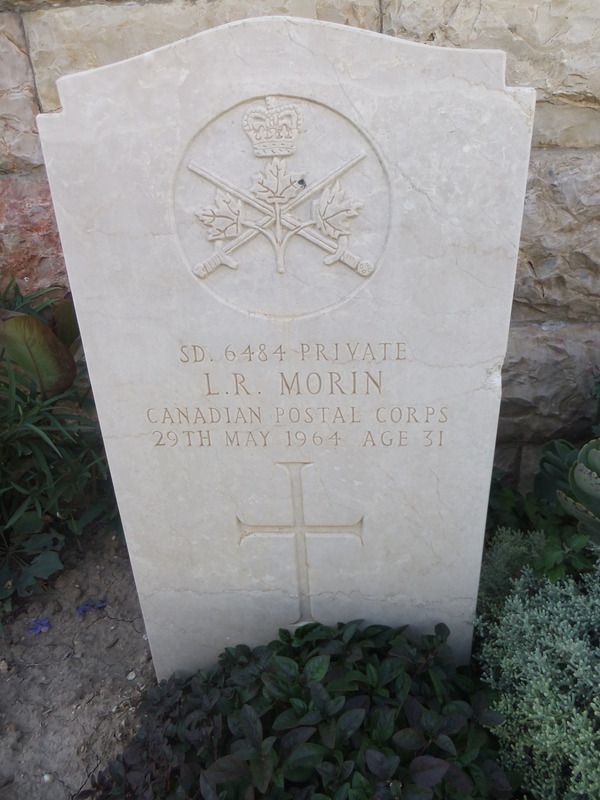 Over 4000 are buried here, from both world wars. 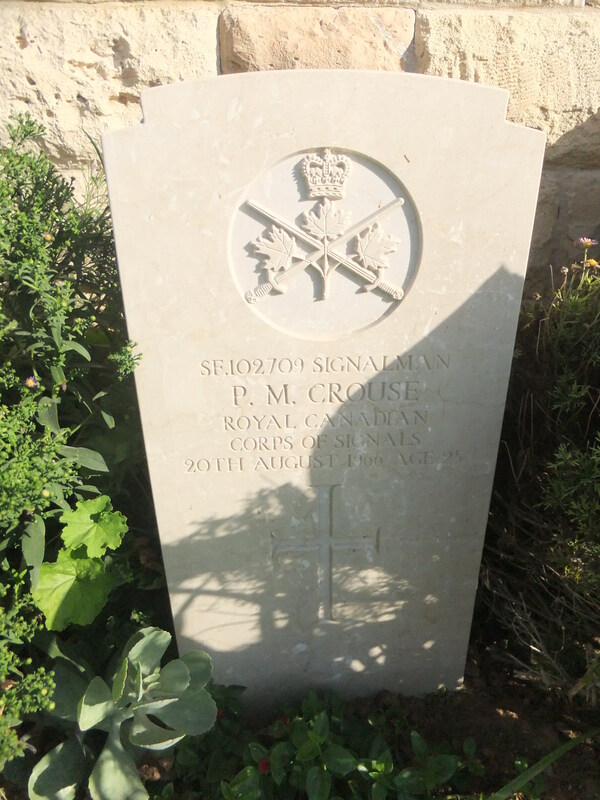 British, Australian, New Zealanders, Polish, Germans, Scots, South Africans, Irish and unknowns are buried in individual graves, with marked mass graves for Indians and unmarked mass graves for 124 Turkish and four Egyptian labourers. And if you look at the left rear of this photo, you can see a stone arch entrance to a special area, just for Canadian United Nations peace keepers, who died from 1959 to 1966. 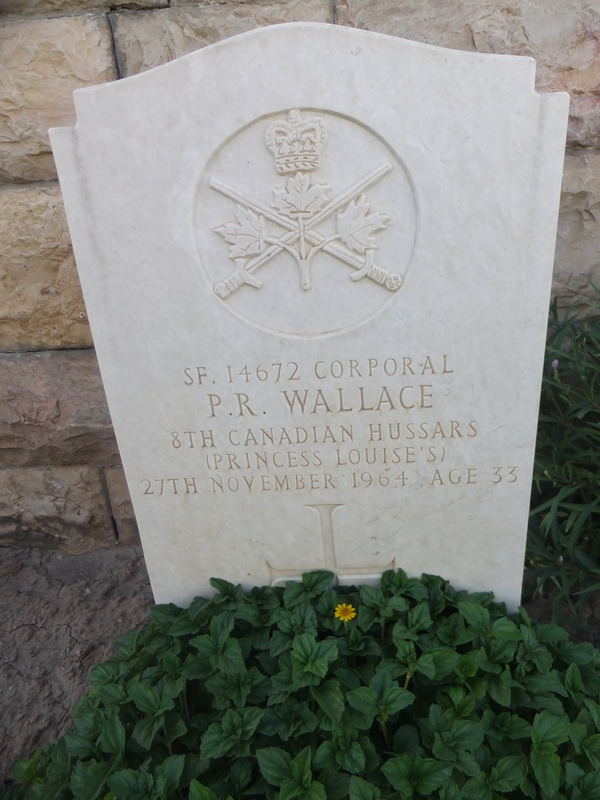 They were part of the UN Sinai peacekeeping mission, following the French, British and Israeli assault on Egypt in 1956. 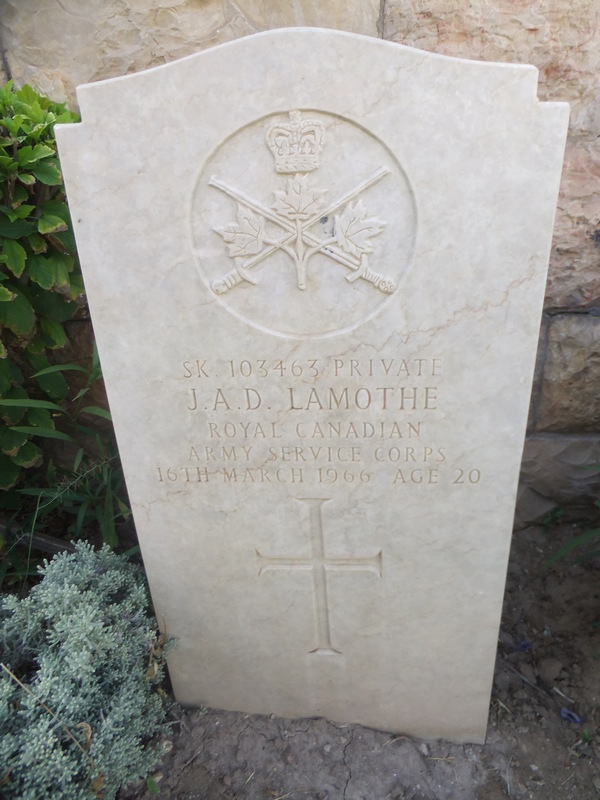 Again, I well know that there are often dirty, behind the scenes, politics involved in any peacekeeping mission, but that does not distract from these folks who died during it. I am not much of a nationalist, but I respect the efforts of good people trying to do the right thing, regardless of their citizenship. 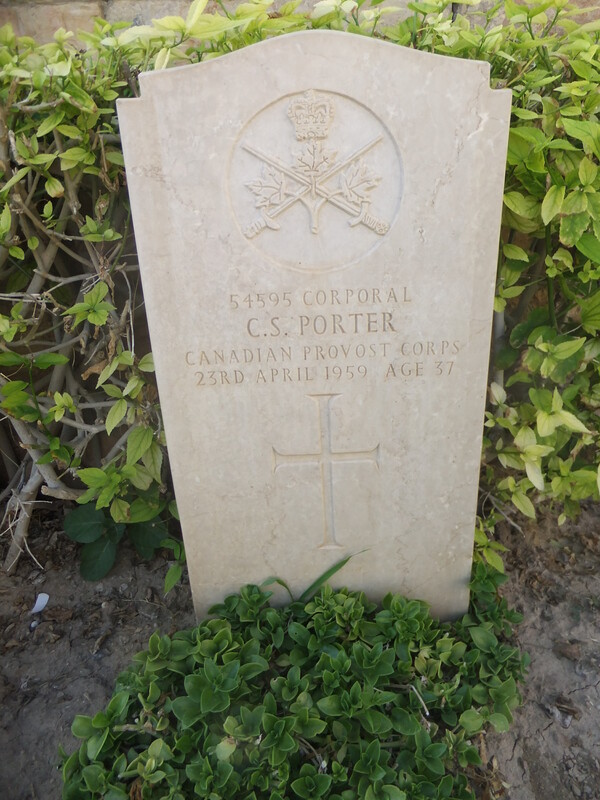 I spent 12 years working as a civilian employee for the Canadian Department of National Defense, and I met a few fine soldiers, who volunteered for peace keeping duties around the world. They sincerely wanted to make the world a better and more peaceful place. 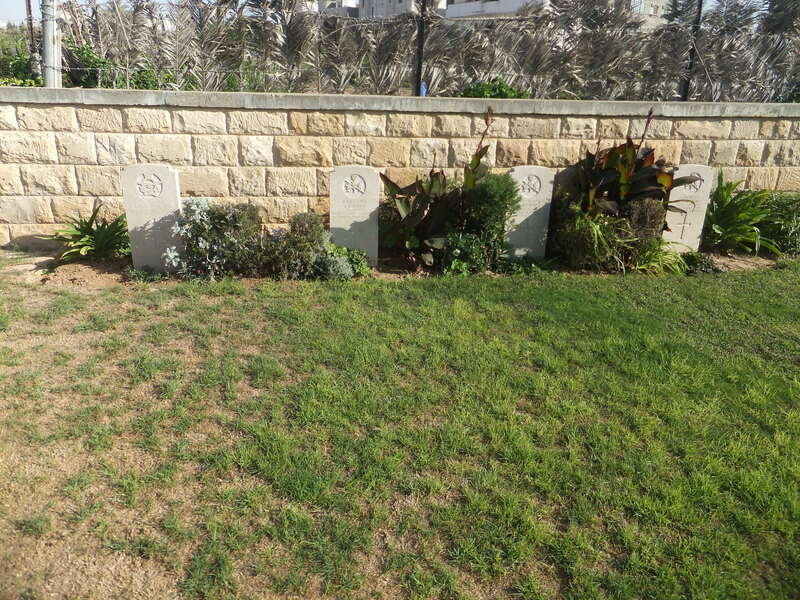 The peace keepers buried here, are certainly receiving appropriate care, attention and recognition for their efforts. 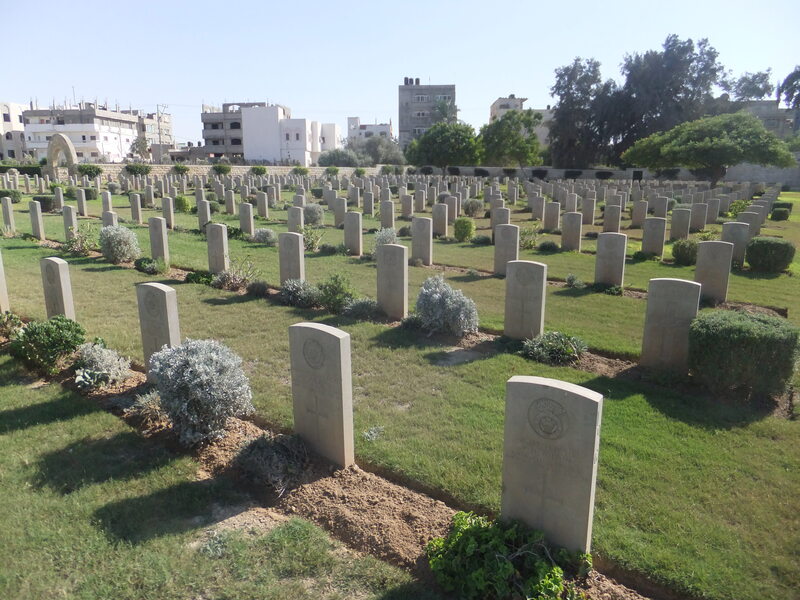 I suspect that due to the Israeli occupation and blockade of Gaza, that few of these 22 soldiers have recently had their families visit their graves. 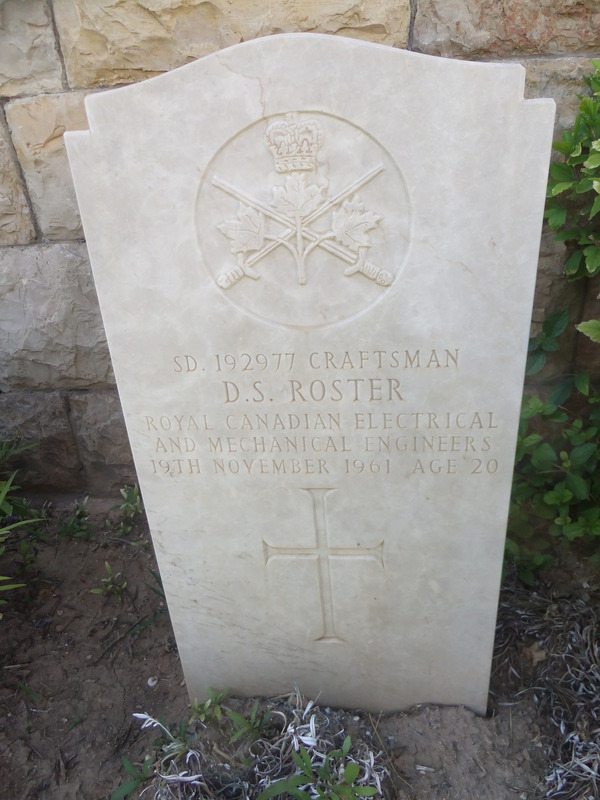 And from personal experience, I know the difficulty of finding and visiting distant relative’s graves. 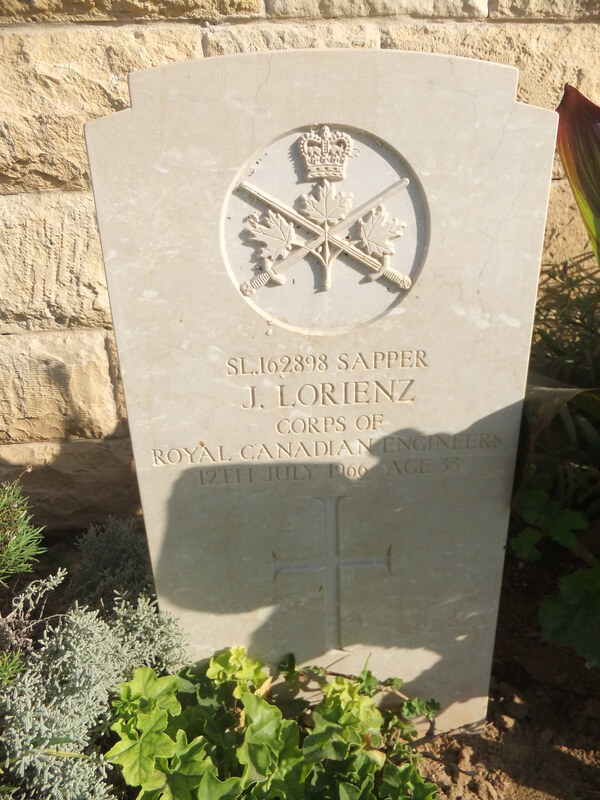 So I took photos of each stone, in case some of these soldiers family members might see this website, and so learn where their kin are buried, and that their graves are being well taken care of. 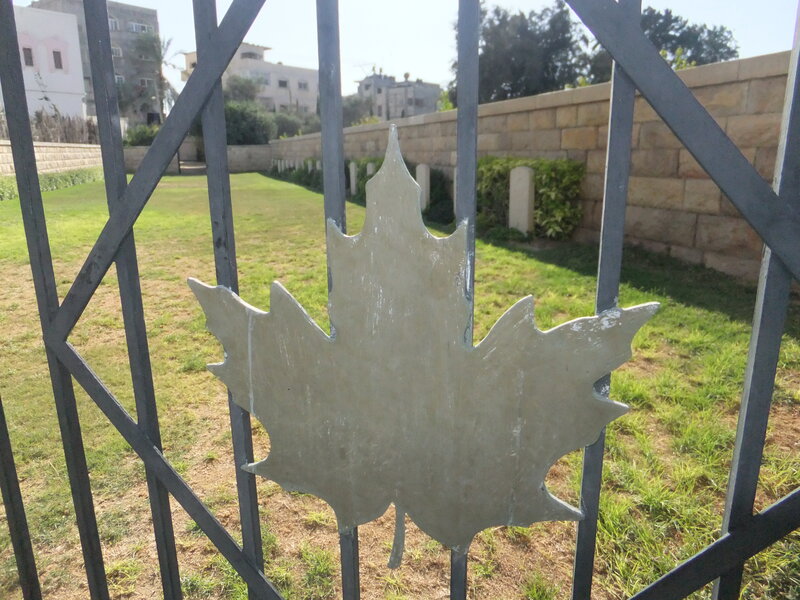 This is the left (East) side of the Canadian cemetery. And here are close ups of those four stones, starting from the previous photo’s left side. Just click on the photo to see an enlargement of it. And here is the right (West) side and below are the 18 individual stones, again going from left to right in the above photo. 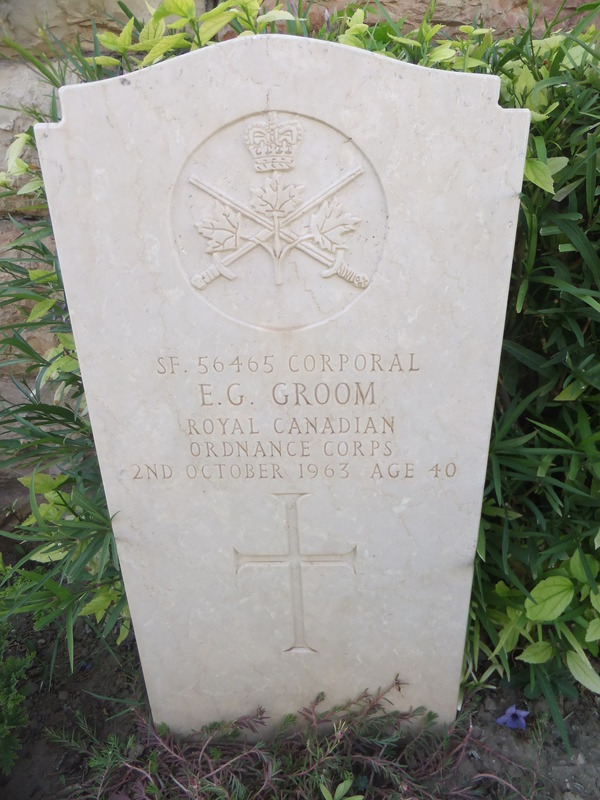 And who, you might ask, was the person who has taken such good care of all these fallen soldiers graves? 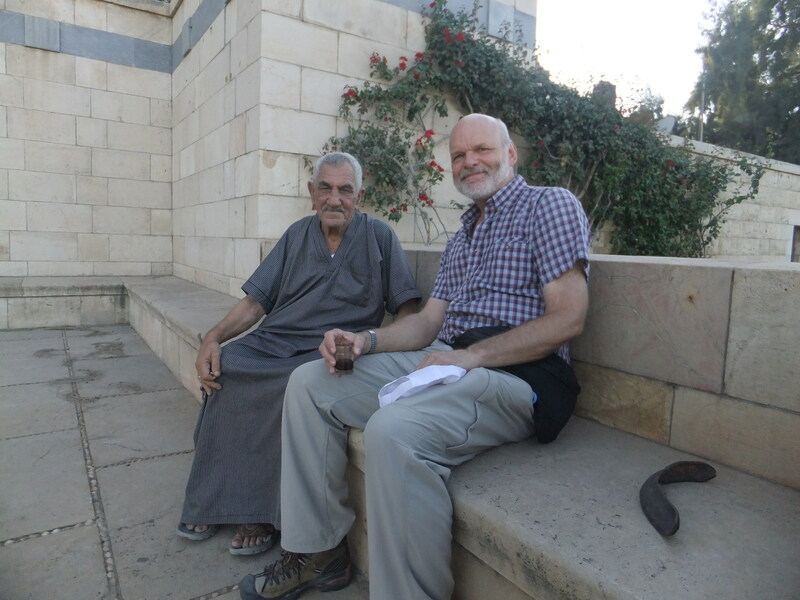 This fine gentleman seated with me,76 year old Ibrahim Jeradeh. 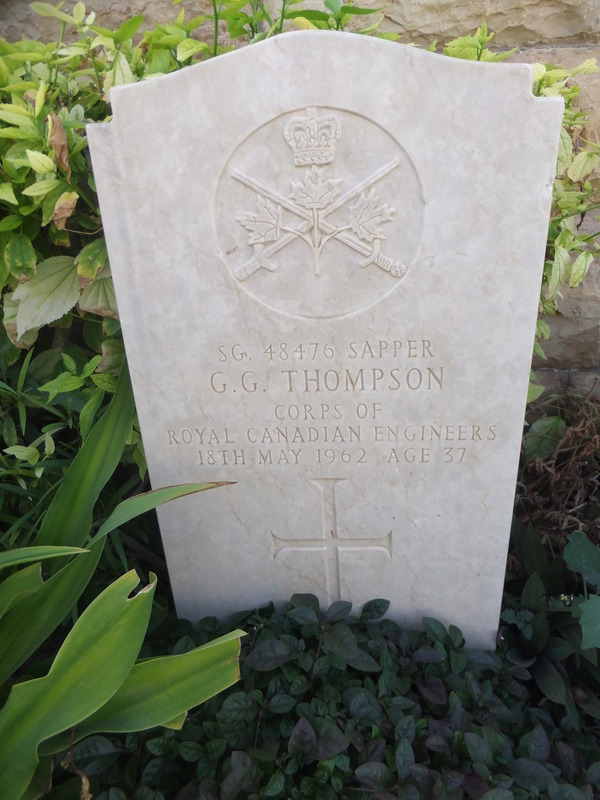 He maintained this cemetery for over 45 years, as did his father before him, and now his son has taken over for him. Ibrahim has been awarded a “Member of the Most Excellent Order of the British Empire” (an MBE) by the Queen for his good work. 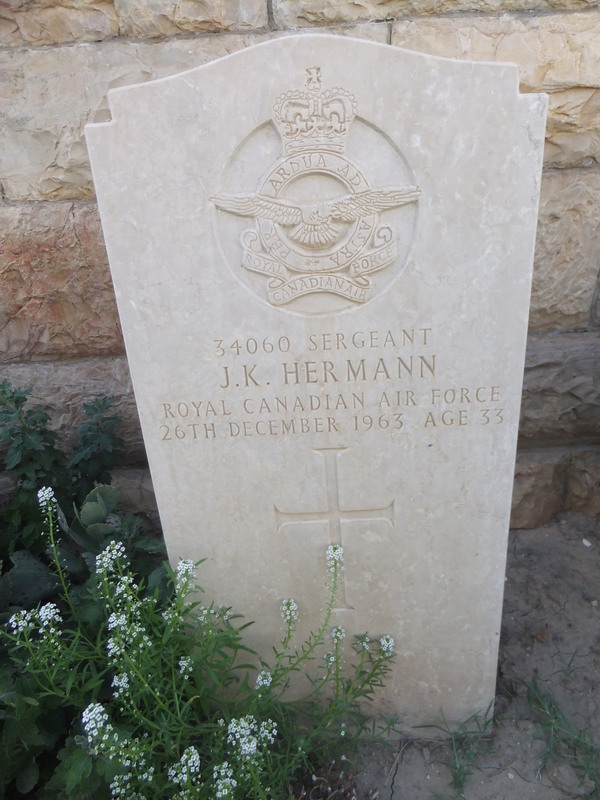 He stayed at his post during Israeli attacks on the cemetery, which left numerous shell holes and broken gravestones. 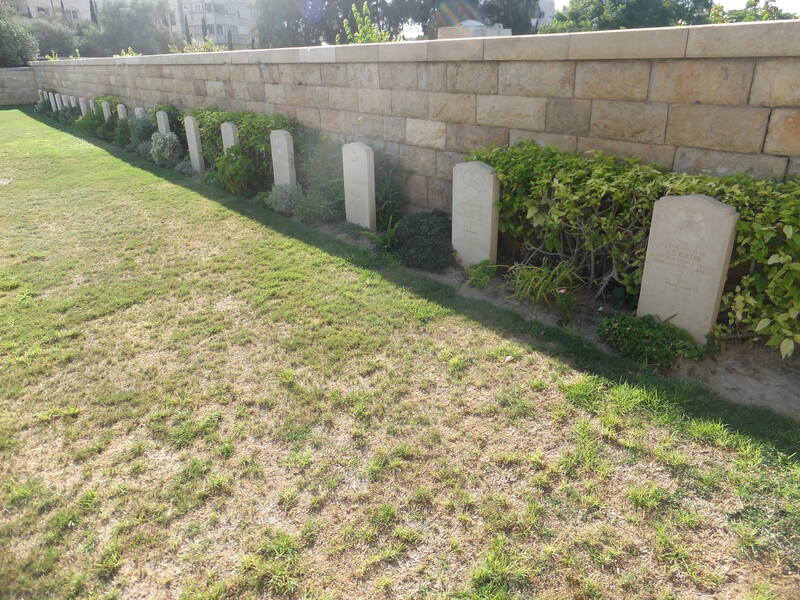 These damaged stones took years to replace, as the Israelis strangely classified the new gravestones, as having some sort of potential military uses, and barred their entry to Gaza. I’m told it took a call from the Queen herself, to put the Israelis straight. 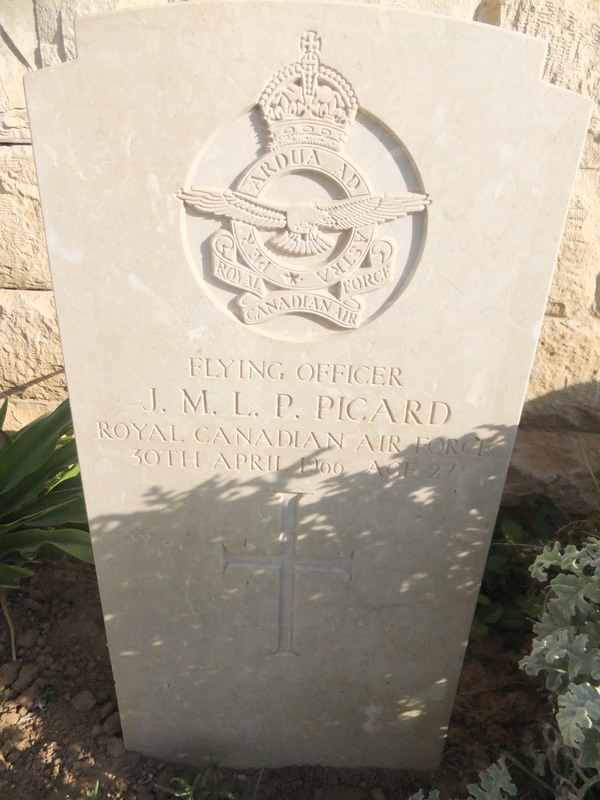 So in these times of war in Syria, I have to wonder if the various leaders involved, just stepped back for a moment, and visited a graveyard such as this one, and a civilian cemetery, from any one of the past wars, and perhaps they would start talking instead of shooting. PS- Yes I’m still in Gaza. I was prevented from crossing into Egypt as planned on the 8th, due to a military flare up in the Sinai. I’ll try again some time soon, when things cool down a little next door. For now I’m doing fine, and am being treated very well here. Gaza Fishers and Farmers. No where to go. 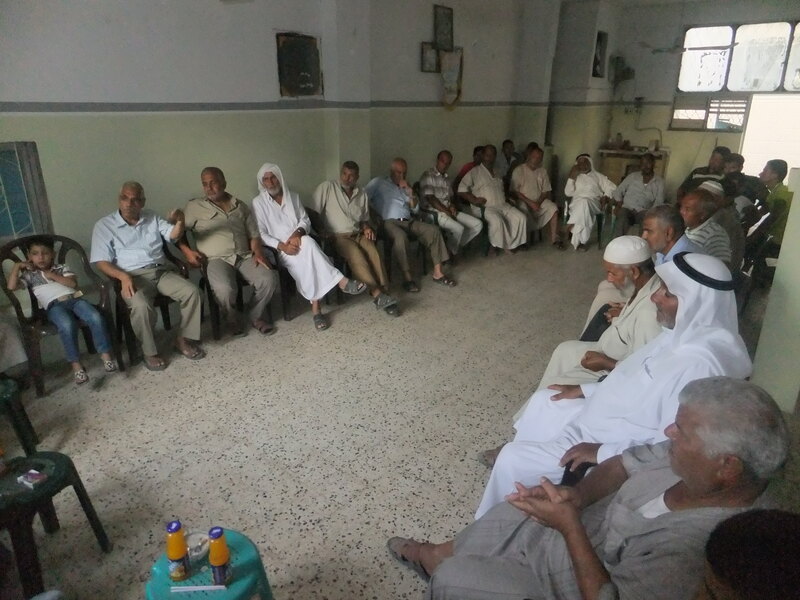 The local ISM internationalists had a meeting with some leaders in the Gazan commercial fishing industry, to hear their stories and see if or how we can assist them. Gazan fishers have historically been some of the poorest families here, especially as many are not refugees, and so do not receive UN assistance. Their lot has been made that much worse with the attacks and restrictions imposed on them by the Israeli forces. Since the July Egyptian Coup, the Israelis have ignored the Nov 2012 ceasefire, that was brokered by the previous Morsi Egyptian government. There’s been a sad litany of recent violations against Palestinian fishers. – the arbitrary reduction of the fishing area from 6 miles to 5 miles. – the Israelis are now holding weekly military exercises within Palestinian waters. Yesterday morning activists watched as an Israeli gunboat cruised along, only 500 meters off the coast of Gaza City. – the Israeli navy usually just shot at ships’ hulls, but are now shooting at the fishermen themselves. -Gazan fishers are being shot at 3 miles, 2 miles and even just 1 mile from shore. Two fishers from Shadi Camp were recently shot by Israeli forces while well inside the new 5 mile limit. – a safety related, permanently anchored, Palestinian light ship, marking their safe fishing limit, was just stolen by Israeli forces. Even with all these provocations, the Gazan government is still striving to keep the cease fire alive, going as far as to pass their own law, to arrest any fisher crossing the 6 mile cease fire limit. And we activists have not been encouraged to accompany the fishers, in case our presence may encourage fishers to “push the envelope” and challenge the Israelis. The trickle down effects of all this on fisher families, eventually hits the youth the hardest, with no funds for education, clothing, proper nutrition and ultimately no next generation at all, as there is no work, accommodations or finances for young fishermen families to get started. And the farmer’s lot is no better, as we found out at a recent meeting in Khan Younis, with farmers who own land close to the Israeli border buffer zone. Even though it is time to plant, these farmers are not even attempting to approach their fields due to Israeli sniper fire. The November cease fire, supposedly guaranteed that farmers could work their land, up to 100 meters from the border, but the Israelis only honoured that for 3 months, and now shoot at farmers 800 meters from the border. And even if they do manage to get plants in the ground, they can not tend and water them due to the danger, and then even if they could do this, the Israeli bulldozers and tanks are flagrantly crossing into the buffer zone and destroying their hard work in minutes. So now their plan is to wait until the Fall rains come, so the crops will not need as much dangerous personal attention from the farmers, and ISM internationalists will be there, to at the very least, document any cease fire violations. But, at a minimum, 3 crucial months of farming some of the most productive land in Gaza, are being lost, in a country desperate for food. And with the tunnels to Egypt now cut off, the Palestinians are left to buy over priced second rate produce and junk food from Israel. As well, they now have to buy Israeli fuel at double the cost of Egyptian tunnel fuel, so everything from taxi rides to the farms to bread for their families, has gone up. And Gaza is going from having power cuts of 8 to 12 hours a day to only having power for 4 hours a day. Besides the personal impossibilities of managing a household of refrigerators, freezers, well water pumps, washing machines, computers and such, on just 4 hours of electricity, give a thought to the hospitals. The famous recent instance, of a Gazan doctor during a power outage, completing an operation using the light of his cell phone, may soon not be so unusual. It would seem the Israeli military is trying to goad the Gazans into striking out at them, and then the “retaliatory” Israeli attacks would begin. And then this one way cease fire would truly end, with rockets and missiles flying in both directions, and the western media will suddenly, but belatedly, take notice of Gaza. There is a desire for peace over here, if someone from the “outside” would just offer some support. One of the positive projects that’s happening in Gaza, which started in Canada, is the Gaza Ark. It’s being organised by the same folks who tried to break the Israeli sea blockade of Gaza in 2011 with the ship the Tahrir, the Canadian Boat to Gaza. The Tahrir was boarded by the Israeli military, while in international waters, and hijacked to Ashdod, along with it’s crew and passengers, who were then jailed and deported. Their crime? Entering Israel illegally! It boggles the mind, but considering the numerous other crimes Israel has perpetrated against the Palestinians, this is just one more minor outrage. 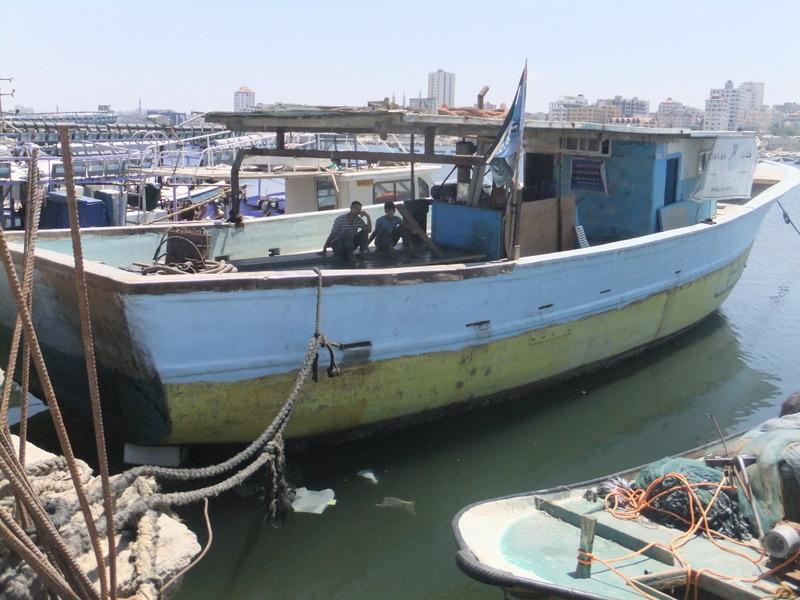 The Tahrir was just one of numerous ships that have unsuccessfully attempted to break the Israeli blockade by sailing into Gaza City. The Canada Boat to Gaza group decided to try a different tact, and try to sail a ship from Gaza City to Europe. 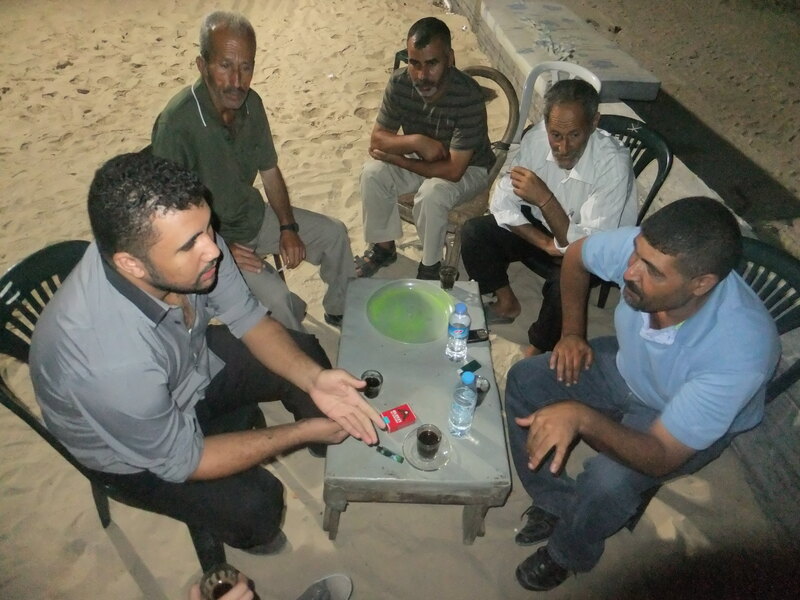 The ship has been purchased and is now being rebuilt by Palestinian workers in Gaza City port. Once it is ready, it will be loaded with Palestinian export products, and sailed out of Gaza by a crew of Palestinians and Internationalists. 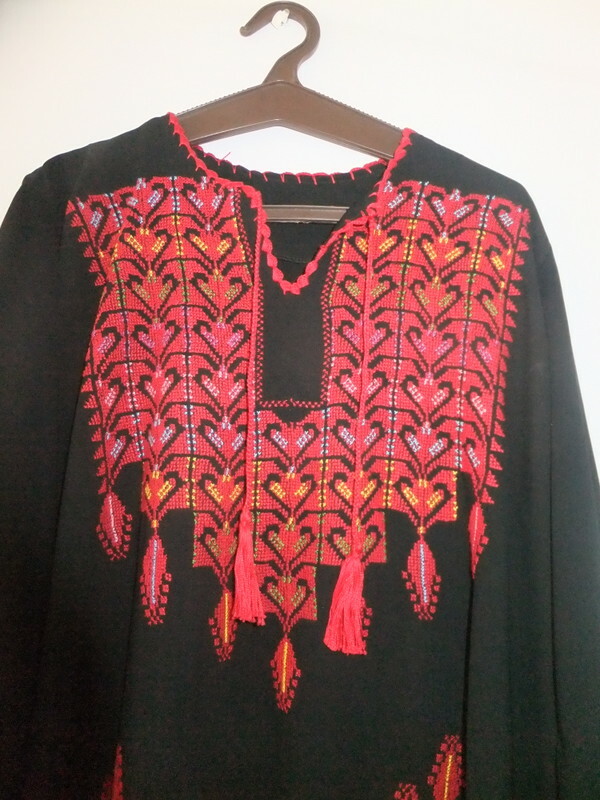 One of the Gazan trade goods that will be on board will be beautiful embroidery, crafted by the Jabalia Women’s Cooperative. 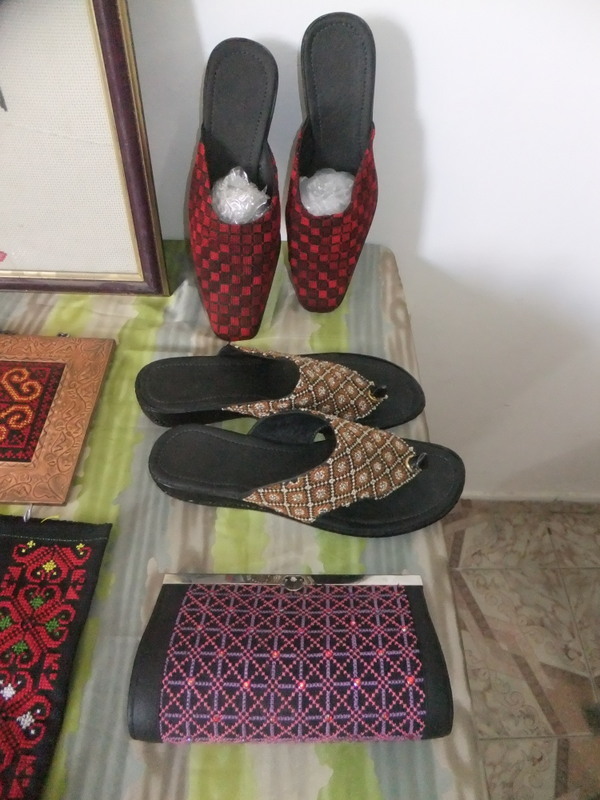 I stopped by their office to document their handicrafts. 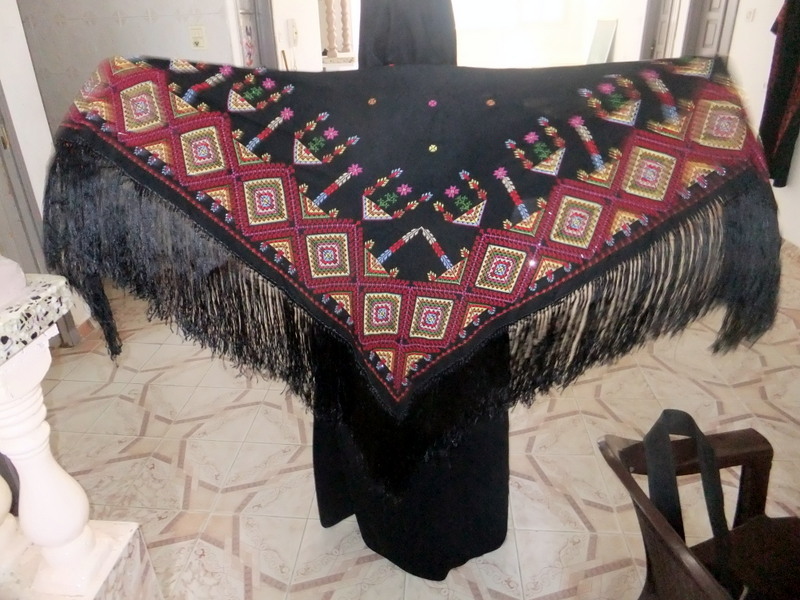 20 women, all from refugee families, make up the Jabalia Women’s Cooperative, carrying on the ancient tradition of Palestinian embroidery. Fayrouz Abu Zaiter, on the right, is their leader. A classic Palestinian “toup”. Each design is specific to a village or family. 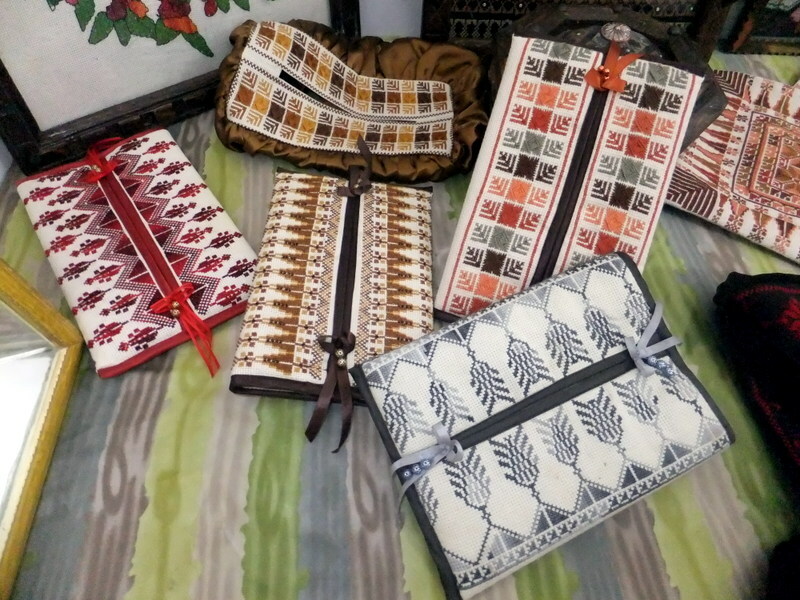 Now they are adapting their skills to produce other beautiful and useful products. And here the youngest member of the cooperative, 21 year old Samer Abu Zaiter, models a scarf, which would have involved 5 or more women, working on it for several days. 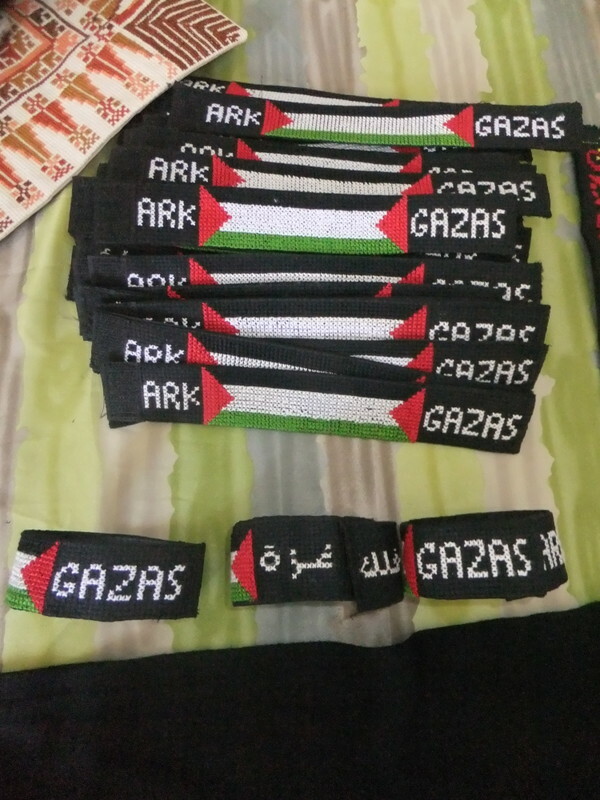 And here are some of the 250 bracelets I will be bringing back to Canada, to be sold to fund raise for the Gaza Ark project. And here’s the Gaza Ark. With the Israeli blockade of Gaza, it’s not going to be easy or inexpensive for Palestinian workers to rebuild her and break this illegal and inhumane blockade.